Sydney-based jazz pianist and composer Francesca Prihasti is about to launch her second album, “Evolving”. The title says it all. After completing her Bachelor of Music in Jazz at Sydney Conservatorium of Music, where she studied with Australian jazz luminaries Mike Nock, Judy Bailey and Matt McMahon, she released her debut album, Night Trip, in 2012 to critical acclaim and has since performed with some of the best in the business (not least among them Dale Barlow); she has played at the SIMA woman’s jazz festival, at Manly Jazz Festival and has done gigs in New York and her hometown, Jakarta. It was there that it all began; her first musical experiences were with her mother, who was a church organist and played gospel music and introduced her to music. It wasn’t until she was in high school that she would discover improvisation, when a friend in her music class taught her how to improvise over a blues form. From then on, she was hooked: “I think improvisation is a unique mixture of forethought and spontaneity”, she says. “It’s like learning a language. You have to learn grammar and vocabularies and then you can be creative with how you say the sentences. Improvisation gives me the freedom to explore many possibilities and help me to find and discover my own musical voice”. While Francesca regularly performs in Sydney and Jakarta, it was New York, the ‘home town’ of jazz where she recorded her first album “Night Trip” (recorded with the rhythm section of Marco Panascia- double and Ulysses Owens Jr- drums), and her latest release, “Evolving” (recorded with Rodney Green – drums and Orlando Le Fleming -double bass and Australian Nic Vardanega on guitar). Both her albums feature original compositions. “Evolving” is the story of a butterfly and its transformation journey, expressing the emotion of serenity and hope amidst uncertainty, faith for what future holds, and the courage to embrace change in life, which we all can learn from and relate to as human beings. “My favourite track from this album is ‘Safe Distance'”, says Francesca, describing her creative path. “[My first album] “Night Trip” is a collection of tunes I have written over the years exploring some elements like Hard-bop, Funk, Afro Cuban, Blues and New Orleans ,while “Evolving” is more like a concept album, where all pieces contribute to one unified story. I am very grateful for the opportunity each day to create music and I would love to keep on writing because the more I do it, the more I can discover my own musical voice and it will help me evolve and develop as an artist. Change doesn’t happen instantly. It happens gradually and I want to strive to honing my craft each day,” outlines Francesca. Both her albums feature original compositions. Francesca first became interested in composing when she arrived in Australia in 2006 and had witnessed some jazz performances around time by Matt McMahon, The Coffin Brothers and Kristin Berardi, among others. Her own compositions draw on influences from Wynton Kelly, Duke Ellington, Horace Silver, Sonny Clark, Red Garland, Duke Pearson, Sonny Rollins, Ray Brown Trio (both with Benny Green on piano and Geoffrey Keezer), as well as traditional forms of jazz including hard bop and the blues. You can certainly hear aspects of Duke Pearson in her harmonic structures as well as harmonic devices of Bill Evans and Herbie Hancock. In small combo jazz the musicians are usually required to improvise around the melody, harmony and structure, coming up with their own responses to the composition. Francesca says she enjoys this part of jazz and having her own compositions performed can be an exciting and democratic process to bring the music to life. “It can be as simple as writing the charts as clearly as possible and I normally play them my compositions first on the piano and they can freely interpret how they’re going to play my music and from there, we can exchange ideas,” Francesca explains. As an emerging jazz artist there are many challenges to face: “Lately, I have been listening to Fred Hersch’s latest solo album and I think he is one of the most lyrical pianists. He doesn’t need words, each note he plays says it all. It inspires me and I think that’s one of the biggest challenges I face as a musician; to be authentic and at the same time able to express my emotions without words (because I’m an instrumentalist) and reach out to others through music”. What’s next for Francesca? “I would love to keep writing music, make more albums and hoping to undertake a master’s degree in Jazz performance overseas,” she says. 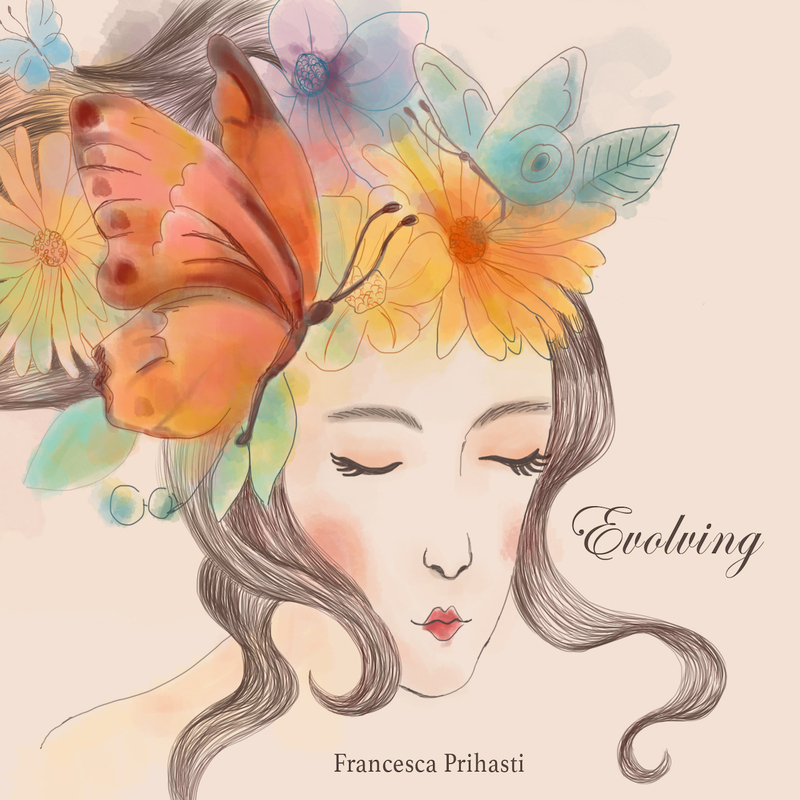 Francesca Prihasti launches her new album Evolving on May 4 at Foundry 616 featuring her Sydney based quartet: Nic Vardanega (guitar) David Groves (bass) and Dave Goodman (drums).